Here a picture of the fences I am working on. Still have to do a gate, assign the colors to the other pieces and build stage. I have F Keyed them but am not sure about F keying the fences because it change the color to the next every time you place a piece so I think I add them to sub toolbars per color so players can choose a color without having to click the F Key several times after placing a piece. I plan to make also regular fences (Just two or three horizontal boards) in the 4 wood colors. Would it also be possible to make fences looking old and worn out? @embx61 if you build your fences, will they be on the outside of a square or in the middle? or do you add both options? I saw you, updated your village set. do you automaticly update your unified mod everytime you update one of the stand-alone ones that are in the unified mod? "Friendship is like peeing on yourself: everyone can see it, but only you get the warm feeling that it brings." They are currently in the middle of a tile. What do players prefer? Middle or Outside as two sets is a bit too much (Maybe after a first release I will think about it to add those). The tile they are build on have collision except the gate so they cannot be build on roads or other build objects. If I mark the tile as road buildable the bannies will wall through every fence piece as it is a road. I will do however a ghosted set as well so those can be build anywhere but the bannies will of course walk through those. I will look into a worn look texture as well. @embx61 if they are on the edge of a tile you can still place flowers right next to the fences. Okay, makes sense. I will put them on the edge of the tiles. True... I always prefer fences on the outside of a tile. I'll second that. That's the only thing that irks me with the Rowhouse mod. There's never enough deco stuff!!! Middle and edge can both be useful. It just depends on where you are putting them and what you are putting them next to. Still working on the fences and some other deco stuff. Decided to put the regular (Two or three horizontal beams) fences on hold and working on the middle tile and edge tile picket fence sets first. Uploaded version 17014 of the Unified Mod. The Unified mod is now current and contain all my mods and fixes except for the overrides and terrain changes mods I did so far and is about 195 megabytes. Uploaded versions 17001 of some ghosted coverings and uploaded Picket fences in 4 colors. The picket fences 1st set is centered on the tile and the other set is on the edge of the tile. I will later create some more different fences to add to the set and looking for some stone walls as well. I working on the pasture for the Village set. After that I will start on the tavern and those 2 will be the last buildings to conclude the set. I included copy's for the cropfield, Orchard, and Storage yard on the Village toolbars so all is together. They are still on the Vanilla toolbars too but I think it is convenient to have those Icons on the Village toolbars too to save on some back clicking. Working also on the statues Mod with more color variations as requested. Added version 17003 of the Statues mod a few days ago but forgot to mention it here. 4 color variations for the 9 famous statues and the column. Those statues are high poly so it is advised to not put a whole lot on the map if your PC is not up to it. I decided to just release them in the same mod instead of separate. As the poly's are only loaded when placed on the map it does not matter and the three extra textures are rather small so not add much. Also just released version 17004 of the roads mod. Added 1 dirt road and 6 stone roads. Save compatible. The Village Pasture is finished and only need AO mapping. I made 5 storage yards a bit mixed instead of all separate as requested a while ago by Paeng who thought that all separate was a bit overkill and I agree. 1 what stores Charcoal(Custom3) and Firewood. Started on the Village Production Set. The tannery is about done beside optimizing, build stages and AO mapping. Then I plan to create a well for water, a salt works, and a shoe maker. When those 4 buildings are done that chain is finished I will release the first version before moving on to the next chain. Somewhere in between I will create the Tavern and when that building is done I will release the final (Besides bug fixing) version of the Village set as about all the vanilla buildings are covered. I will at some point like to add about 4 to 6 F Key stone houses to the set and then the set is really finished. I'm loving your village set, Embx61! The styling is very soothing and pleasant, and the coloring (mostly the brighter one- which is not overly bright) adds to the soothing, pleasant perception. I love looking at your buildings, especially that covered bridge. Something that would be good to add is a house with a smaller footprint. In some areas smaller sized houses are desired, and also sometimes I, and others, play with smaller scaled items or mix in with other houses that are not as large look. I hope you might consider making a smaller sized house. I am glad you are planning to add stone houses. Thank you so much for all you have made for the game, which has helped make it so much better a playing experience! To be honest and I hope this is not taken the wrong way. I am not really into making thing too small as the scaling with Vanilla will be completely off. Who want to live in a little shoe box? So why should Bannies have to work and live in little shoeboxes? Watch for example "Little House on the Prairie" and the houses are even bigger then in Banished. My Village Houses fit very well scale wise with Vanilla Banished (4x5 Including Road) and are only looking too big if placed next to those small houses which are modded in. A fact is though that my houses are not too big but those small houses are too small. I can understand that some players like everything small but I am not the right modder to create those. Because of the scaling what will be off I will not having fun making them so they will probably never get finished if I even find the mindset to start on them. 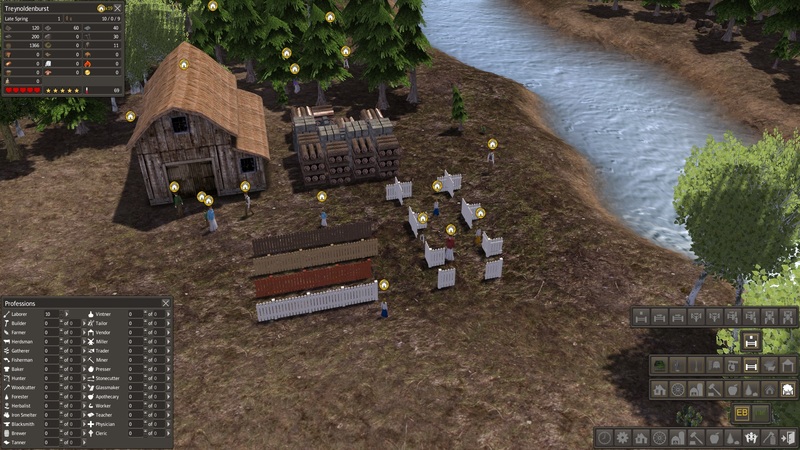 As Modder I try to stay as close as I can with the vision and scale developer Luke had with Banished. I made some of the Vanilla production buildings a bit smaller then Vanilla but they are still in the right scale even when a bit smaller then the Vanilla ones which are indeed maybe a bit too big but I will never create a 1 tile production building as it makes an already so easy game even easier so I consider those just a cheat and I am not into creating cheats beside some very small overrides some players asked for as I code a override within 5 minutes. To make it clear this is not a attack of any sort against modders who do create small stuff as every modder can create what they want and every player can ask what they want but as I said earlier. As for creating small buildings which are off scale wise with Vanilla I am not the right modder. I understand that you don't like small houses. Yes, your Village house does fit very well in the scale of the Vanilla game. I wasn't meaning that it was overly large in the scale of the basic game. I just meant that I personally would also like a smaller version as well. I don't think a house a tad smaller (not a miniature tiny house) than your current house would be off scale with the Vanilla version, if made within your scale. People might not want to live in a "shoe box", but in mining company towns of the US, for example, that's basically what there was to live in for many. (Eg: https://images.search.yahoo.com/yhs/search;_ylt=A0LEViRLK7dZPssAQ5MnnIlQ?p=+mining+company+housing&fr=yhs-mozilla-001&fr2=piv-web&hspart=mozilla&hsimp=yhs-001). But, it it nice that your vision does not have people crammed in small houses with just two rooms, perhaps three. How is a tiny building like a cheat, or making the game any easier? For example, the tiny wood chopper mod is just like the wood chopper building in the vanilla game, except it's just the man with his ax. I don't think any more wood gets chopped. You will not like to know that I have the tiny wood chopper next to your Materials Store, chopping wood for the store! I accept that you don't want to make a smaller version of your house. It didn't hurt to ask.